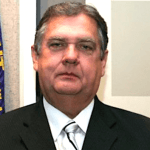 Clay Co., sheriff prohibited from participating in supernumerary program, participation in Employees' Retirement System authorized, Act 2017-193, 2017 Reg. Sess., repealed, const. amend. Proposing an amendment to Amendment 671 to the Constitution of Alabama of 1901, now appearing as Section 4, Local Amendments, Clay County, Official Recompilation of the Constitution of Alabama of 1901, as amended, to prohibit the Sheriff of Clay County from participating in the supernumerary program of the county and to allow the sheriff to elect to participate in the Employees' Retirement System; and repealing Act 2017-193 (2017 Regular Session). (a) No elected or appointed Clay County official may assume a supernumerary office after the effective date of this amendment December 13, 2000. Any person who, on the effective date of this amendment December 13, 2000, is entitled to participate in a supernumerary program may continue to participate in that supernumerary program, which shall include the assumption of a supernumerary office according to the terms and conditions of the law which established that supernumerary program. Every elected or appointed Clay County official may participate in the Employees' Retirement System of Alabama upon the same terms and conditions as may be specified by law for any other employee in the same retirement system, and shall be treated as an employee of the county. Clay County officials holding office at the time of the ratification of this amendment on December 13, 2000, shall be eligible to purchase service credit in the Employees' Retirement System for the time the official has served in the current office. No person may participate in both a supernumerary program and the Employees' Retirement System based on the same service. For the purposes of this amendment, the words "elected or appointed Clay County official" shall include, subject only to express limitation, any person elected to represent Clay County in any representative body of the state and includes any person appointed to serve the remaining term of an elected or appointed Clay County official. The words do not include a judge, district attorney, constable, school board member, or any official elected from a judicial circuit. (b) A Sheriff of Clay County first elected after the ratification date of the amendment adding this subsection may not participate in a supernumerary program and may participate in the Employees' Retirement System of Alabama upon the same terms and conditions as may be specified by law for any other employees in the same retirement system. The Sheriff of Clay County holding office at the time of the ratification date of the amendment adding this subsection shall be eligible to purchase service credit in the Employees' Retirement System for the time he or she has served as sheriff. The sheriff shall forego the assumption of a supernumerary office and shall make the election within one year after the ratification date of the amendment adding this subsection." Act 2017-193 of the 2017 Regular Session is repealed. An election upon the proposed amendment shall be held in accordance with Section 284.01 of the Constitution of Alabama of 1901, as amended, and the election laws of this state. Relating to Clay County, proposing an amendment to Amendment 671 to the Constitution of Alabama of 1901, now appearing as Section 4, Local Amendments, Clay County, Official Recompilation of the Constitution of Alabama of 1901, as amended, to prohibit the Sheriff of Clay County from participating in the supernumerary program of the county and to allow the sheriff to elect to participate in the Employees' Retirement System. February 1, 2018 H Assigned Act No. 2018-37. February 1, 2018 H Delivered to Secretary of State at 12:42 p.m. on February 1, 2018.